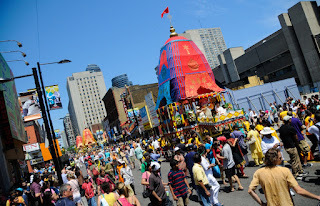 Ratha-Yatra Launch Day - Sunday, May 1, 2016 ~ The Toronto Hare Krishna Temple! With warmer weather finally here, the excitement surrounding the 44th Annual Festival of India (Ratha-Yatra) is growing as each day passes! Sunday, May 1, 2016 will mark the official launch of the countdown to this year's festival! The program will begin at 6:00pm and will continue to 9:00pm (extended program). A special feature of the festival will be the chance for all devotees to observe a special fire yajna wherein auspicious mantras are recited and grains are offered into fire! I would like to seize this opportunity to thank you for all the work that you do for us. Despite having a material work you manage to balance it with KC and more importantly teach bhakti sastri course with all the drama and fun. Thank you for the very kind words, dear anonymous devotee! I consider myself lucky to serve the incredibly wonderful devotees of our Toronto Hare Krishna community! IIHare KrishnaII absolutely an incredibly blissful evening on Sunday May 1st. Hare Krsna Anand! We're so glad that you enjoyed the evening!!! Hare Krsna. I always look forward to the Sunday evening at Iskcon Toronto, tremendously blissful atmosphere and love to chant the Maha Mantra always, the energy there is at its highest! Hare Krsna. Hare Krishna Anand! We love hearing that you feel so inspired when you come to the temple. Thank you! Hare Krishna!